Munich is a major economic centre in Germany and home to the largest number of listed companies and private equity houses in the country. 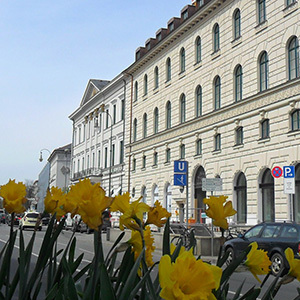 Tracing back its roots to 1974, the Munich office regularly represents and advises leading domestic international businesses, from DAX 30 corporations to mid-market and emerging enterprises. Our Munich team with more than 80 lawyers and tax consultants is highly regarded for its in-depth experience and integrated approach across our core practice areas, including our corporate, M&A, litigation, employment, competition, IP, real estate and tax practice groups; with respect to capital markets and investment funds we cooperate closely with our Hamburg office. The lawyers in our Munich office offer seamless advice across our 66 offices in 32 jurisdictions working with our well-established network of partnering law firms across the globe. We are frequently involved in a large number of cross-border transactions. Innovation is at the heart of our culture and we strive for individual solutions based on our deep understanding of our clients' needs. If you are coming from the direction of Stuttgart, turn into Verdistrasse at the Autobahn circle intersection. Verdistrasse changes its name twice turning into Amalienstrasse and then Menzingerstrasse. Continue until you reach Wintrich-Ring and turn left in the direction of the "Messe". Continue on Wintrich-Ring into the Petuel Tunnel and then take the first possible right-hand exit and head up Leopoldstrasse up until the end where you reach Odeonsplatz. Turn right into Brienner Strasse, Eversheds Sutherland is further down on the right. If you are coming from the direction of Salzburg, stay on the Autobahn until you reach Mittlerer Ring and then turn right. Change into the left lane and turn into Prinzregentenstrasse. Stay on Prinzregentenstrasse until it becomes von-der-Tann Strasse, immediately turn left and again turn left into Ludwigstrasse. Turn right and head on to Odeonsplatz. There, turn right into Brienner Strasse. Eversheds Sutherland is further down on the right. Exit the Autobahn at "Mittlerer Ring" in the direction of Schwabing. At the first traffic light turn left into Leopoldstrasse and follow it to the end where you reach Odeonsplatz. There, turn right into Brienner Strasse. Eversheds Sutherland is further down on the right. Follow the Autobahn until the end. At the intersection, turn right into Prinzregentenstrasse and continue, keeping to the right. Prinzregentenstrasse becomes von-der-Tann Strasse. Turn left and turn left again into Ludwigstrasse. Turn right and continue to Odeonsplatz. There, turn right into Brienner Strasse. Eversheds Sutherland is further down on the right. Follow the Autobahn until the end. At the intersection, turn right into Prinzregentenstrasse and continue, keeping to the right. When Prinzregentenstrasse becomes von-der-Tann Strasse, turn left and turn left again into Ludwigstrasse. Turn right and continue to Odeonsplatz. There, turn right into Brienner Strasse. Eversheds Sutherland is further down on the right. From the main Train Station, take the underground U4/U5. Alight at Odeonsplatz and exit the underground passage at the exit marked Oskar-von-Miller-Ring. We are directly located on the right hand side. From the airport, take the S1 or S8 to Marienplatz. Change lines and take the underground U3/U6 to Odeonsplatz. Exit the underground passage at the exit marked Oskar-von-Miller-Ring. We are directly located on the right hand side. If you take a taxi from the airport, the ride takes around 50 minutes and costs approximately EUR 75.